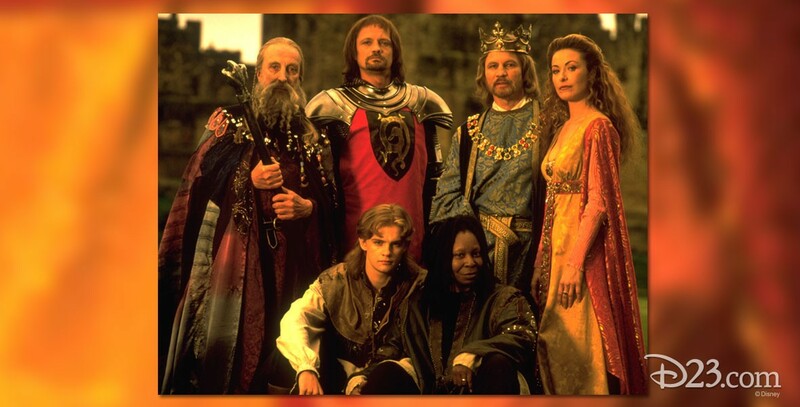 Knight in Camelot, A (television) Two-hour television movie; aired November 8, 1998, on The Wonderful World of Disney. Computer researcher Vivien Morgan finds herself transported back in time to 589 A.D. at the court of King Arthur. Convincing everyone she has magical powers, she sets about introducing 20th-century “improvements” at Camelot with the aid of Clarence, a quick-witted young page of the court. But perhaps Camelot is not ready for Vivien’s “progress.” She soon has rivals, including the crafty Merlin. Directed by Roger Young. Stars Whoopi Goldberg (Vivien), Michael York (King Arthur), Simon Fenton (Clarence), Paloma Baeza (Sandy), James Coombes (Sir Lancelot), Robert Addie (Sir Sagramour), Ian Richardson (Merlin), Amanda Donohoe (Queen Guinevere). Filming took place in England and at MaFilm Studios near Budapest, Hungary. Released on video in 1999.